As they rant about corporate rock, finding jobs, or just about anything else, it becomes clear that Bomb The Music Industry! is unlike any typical rock band. Their lyrics back up their band name, and the ska/punk/rock band out of New York does everything but endorse what corporations have done to modern rock bands. Riddled with harsh language, Bomb The Music Industry!’s passion is more than apparent. and eight dollar wines. I don’t wanna be part of this night. Regardless of their controversial lyrics, Bomb The Music Industry! has garnered the attention of The Office and Weeds, and had their songs featured on the shows. They have also made it a point to only play shows that are open to all ages and only charging $10 or less for shows, insuring younger crowds the opportunity to see them live. Fans are also encouraged to make their own tshirts for the band with stencils the band puts online. Fans should come prepared to the show because Bomb The Music Industry allows concert goers to sing onstage with them, and even play if they bring their instruments. 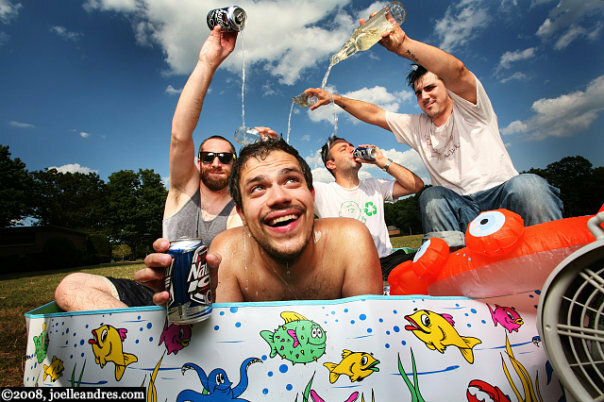 Jeff Rosenstock has led the bands changing lineup through the band’s 14 albums, and several headlining tours. Even more, they headlined Skappleton, the ska festival in Wisconsin, in 2007. Rosenstock works as lead vocals, guitar, and has been known to play the piano with his feet as well. Prior to their summer tour this year, the band announced the summer tour could be its last, and that they would be going on an indefinite hiatus. In the post on their blog, they said that they had never intended to be a touring, money making band, and it was only due to their fans enthusiasm that they began touring in the first place. Although since then, they have re-started touring again. Bomb The Music Industry will be playing at the Black Cat on Sunday, November 25th. Tickets are $10 (as per usual with the band) and doors open 8 p.m.